Has anyone found a decent source (i.e. cheap!) 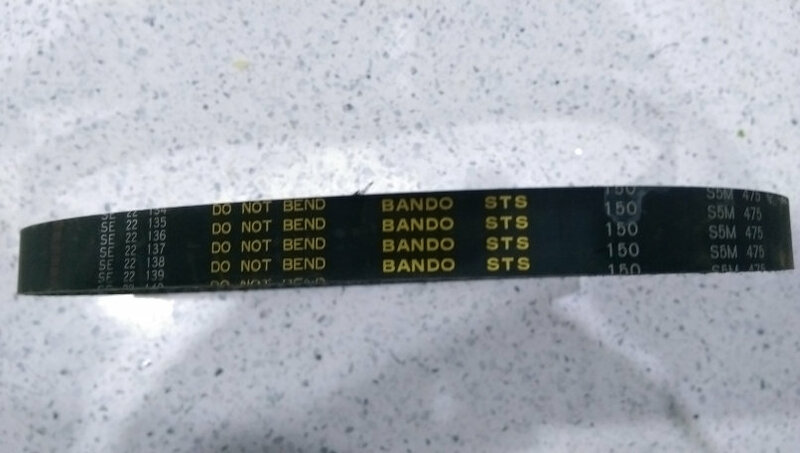 for replacement Model 3 dash timing belts? I believe the Sega part number is "601-9173 TIMING BELT"
If you have one to hand or know someone who can check, if you find out how many teeth it has and the belt length and width you can usually check on google for a matching belt. Sometimes the belts will also have some other numbers/codes on it which googling can find alternatives. I was looking for a replacement for the Happ 270 force feedback belt as I bought a wheel assembly that was missing it and happ wanted $15 for theirs, but from another assembly I found 140XL printed on the belt and was able to find an alternative for under £3. Allthough I think the more expensive Happ belt is a stronger replacement. I have a belt on another dash, I'll have a look to see if it has any details printed on it. Otherwise I guess I'll be counting teeth! Stripped a dash down and it seems the belt is indeed marked up with useful info. Of course, I could be wrong, feel free to correct me! Might be worth giving them a try to see if they can supply or know a company that can. Thanks chaps - they both look like good options, I'll give them a go. £6ish is more the kind of money I was thinking of. How did these turn out? Pretty sure the model 3 dash is same as F355 dash. I got F355 belts from RS, £8.50 inc VAT delivered, there Continental brand made in Germany, never had an issue. Do you get a deadline, or did you before replacing?